Best Teepee Tents: Also called tipi tents, this age-old design is making a comeback. In fact, according to Google Trends, the demand for modern teepee tents for kids for all manners of usage began in 2012, when the graph took a sharp turn to the north. 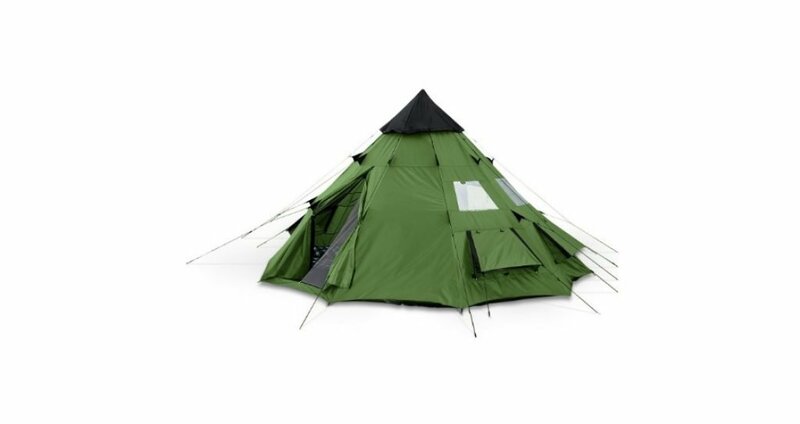 These tents are lightweight, easy to use, and easy to assemble and disassemble. Originally used by the Native tribes of the Northern parts of America and Canada, these 7 best teepee tents are more modern and have all the essential amenities required for a camping trip. Hundreds of years ago, when the teepee tents were first used, they had four different advantages: they were durable, were warm in the winters and cool in the summers, and unaffected by heavy rains. Most modern teepee tents also share the same advantages. They are much more than that, however. So, in case you want to buy the best teepee tents, we have the complete list for you. Before we go to what the criteria for choosing the best tipi tents are, we will give you the list of the best teepee tents which are currently available. Be sure to choose any one of them. “Teepee Tents for Kids” is indeed one of the most-searched keywords in this niche, and due to this high volume of interest, we have tried our level best while preparing this list for our beloved readers. This is the first item on our list. Guide Gear is a renowned name in the business of camping and hiking equipment including tents. This tent is lightweight and is a great buy for campers and hikers. This teepee tent can comfortably tuck in 2 sleeping cots, which indicates a wide footprint. This is also the smallest tent on this tent and is also the lightest. With the sleeping cots inside, we found that it could easily accommodate 2-3 people inside plus gear; take out the cots and you can fit in 4 people inside. The olive green color is distinctive and gives off a military camouflage-like feel. We come now to the design aspects of the teepee tent. It has a very durable build as, like any other competent tent. At the center of the tent is a steel rod, which gives it the desired durability. To protect it from any inadvertent lightning strikes, there is a plastic cup on the ground to provide the necessary insulation required. Installing it takes a single individual; however, we recommend that two people should do the installation, where one person holds the center pole in place while the stakes are dug in by the helping hand. In total, there are 10 panels that go into making up this teepee. It also gives the circular cone effect which makes it a typical teepee tent. Keep in mind that each of the panels is seamed with a waterproofing agent in order to ensure that there is better-inbuilt resistance to inclement weather like heavy rains etc. That said, the Guide Gear Teepee Tent 10′ x 10′ is probably not the best idea to use in heavy downpours. Despite having a rain fly, there is a tendency for the tent to leak allowing the water to enter inside during heavy rains; thus you must always carry a bottle of spray-on waterproofing agent to use. There are weatherproofed windows that have internal shades for privacy, something that we like. The center steel pole is sturdy and can be grabbed when standing or when changing clothes. 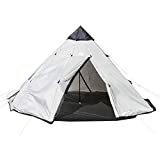 In short, it is surely one of the best teepee tents for camping purposes, which you can purchase right now in 2019. Excellent stability due to the central steel pole. Large build with a wide footprint; enough space for two to four adults when two sleeping cots are inside. Easy to set up; one experienced person can do it. Added rain fly for extra protection. Users’ reviews suggest that the price is rather reasonable. Not ideal for inclement weather and during thunderstorms. Added ventilation options may make it too cold during winters. Significantly bigger than its sibling, the second item on our list is also manufactured by Guide Gear. One great addition to the tent is the roomy vestibule, which is also rather unique to look at and somehow increases the size of the overall tent. The vestibule serves two purposes: you can leave all your muddy shoes there and prevent the insides of the tent from getting messy. It can also act as a very private bedroom for your pet/s. As with almost all the modern and professional tents, this one too can be set up by just a single individual. 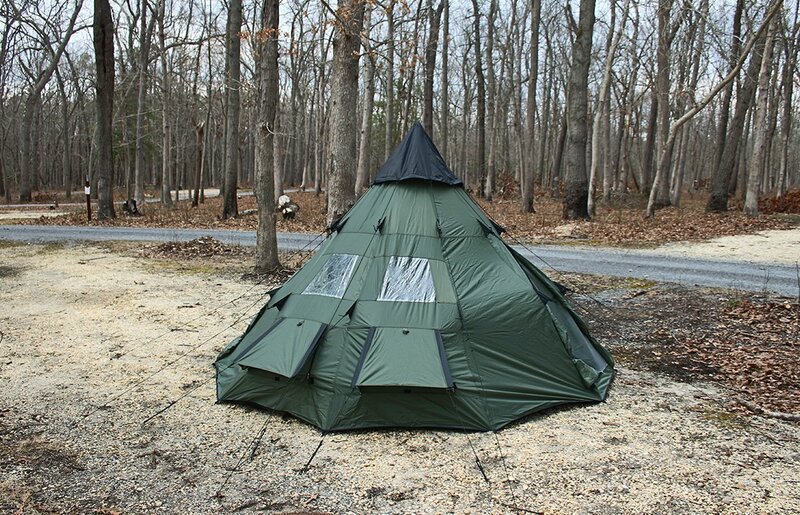 The Guide Gear Deluxe has a steel pole at the center; after all, it is a teepee tent and such a tent needs only a single central pole to stand up. 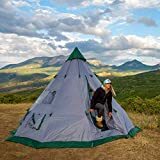 The one thing which we liked the best about this tent is the material: it has a 190-denier polyester shell alongside a 1,200mm polyurethane waterproof coating, which makes it significantly better in quality than most of the tents on this list. Can be installed by a single person, while we advise that two people do the installation. Once inside, you will find it very roomy and pretty well ventilated. This makes the tent ideal for large groups of people. Again, waterproofing is an issue here; even with the rain-protected ventilation options, the tent does leak during heavy downpours. To that end, before you head out to your next camping expedition, make sure that you carry a seam sealer. The pull-through guy lines are easily adjustable. In very windy conditions, like in West Texas, for example, the tent handles remarkably well. Hence, it is recommended for use in the summertime and is ideal for camping in hot weather conditions. At about 9 feet in height, it will easily accommodate a lot of adults. In case you want, you can also use a Little Buddy propane heater inside the tent. The stability and durability are excellent. Extremely spacious on the inside and ideal for three cots. The tent has a vestibule which serves multiple functions. At the price mentioned, serves as an excellent product. When the winds get very strong, the ground pegs may not prove to be strong enough. That is also an issue. Lacks installation directions, may be troublesome for first-time users. We take a break from Guide Gear products and come to Winterial products, which makes extremely good teepee tents. 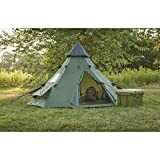 This is a size that is in-between the first two items on our list, as it is a 12 by 12 tent and can be easily used to house 6-7 people. This is easily the most durable tent on our list as it is manufactured with 210T Polyester. This makes it a tent that can withstand the extremes of weather and can also withstand high wind speeds. All of these things and yet, the tent weighs a mere 15 pounds. The Winterial teepee tent can accommodate 3 sleeping cots beside gear; with this setup, it can accommodate 3 more people. Sans the cots, like we said, it is enough for 7 people. Two things that we strongly like about this item are that it comes with a waterproof cap. To give it that extra edge, it also boasts a tarp which is excellent for extra protection from the weather. The design of the tent is better than most other tents on this list and is certainly the most stylish teepee tent. There are excellent ventilation thanks to the multiple air vents as well as the open air vent located at the tip of the teepee just beneath the green rain fly. This makes it an ideal tent for hot and humid days. However, this tent does have a major flaw: it lacks mesh covers, thereby providing an opportunity for all sorts of bugs to craw inside. Besides, the tent lacks any kind of storage compartments inside and this makes an organized trip slightly more difficult than we would have liked. For DIY lovers, there are lots of options. You can sew in storage compartments, hack off a side to use a small portable stove inside, and do similar stuff. Lastly, you can also ensure that this tent stays put by buying a separate pair of stakes, like these ones which glow in the dark. This product is surely deserved to be added to this comprehensive list of best teepee tents for kids of 2019. Excellent design and distinctive color scheme. Easy to set up; experienced campers can do so in around 5 minutes. Unlike many comparable tents, this one withstands inclement climes better than most. Lightweight at only 15 pounds; can be carried around in your backpack. The lack of mesh makes it vulnerable to bug attacks. DURABILITY: Our tent is made of 210T Polyester that provides long-lasting use and protection from the elements. Pack weight 15lbs! EASE OF SETUP FAMILY TEEPEE TENT: We have designed this tent to be very easy to setup. Our team was able to do this in 5 minutes or less! CAPACITY: This tent has a capacity of 6-7 people! Perfect for family camping or adventures with friends. 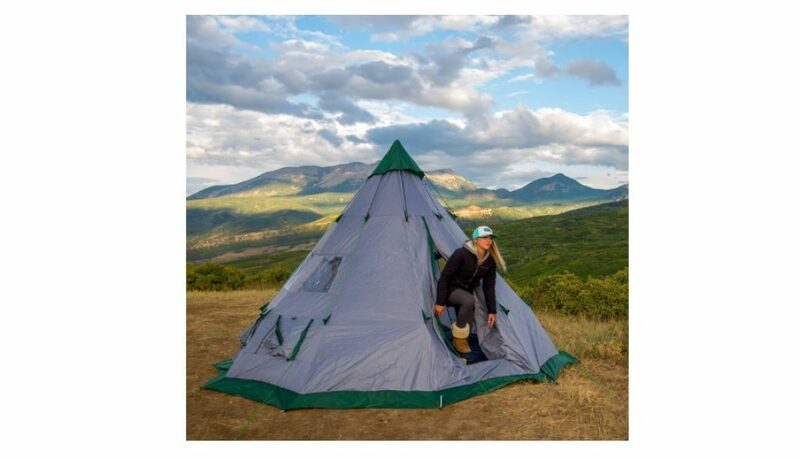 This is the perfect family tent for any adventure! WATERPROOF: Included is a waterproof rain cap for the top of the tent. 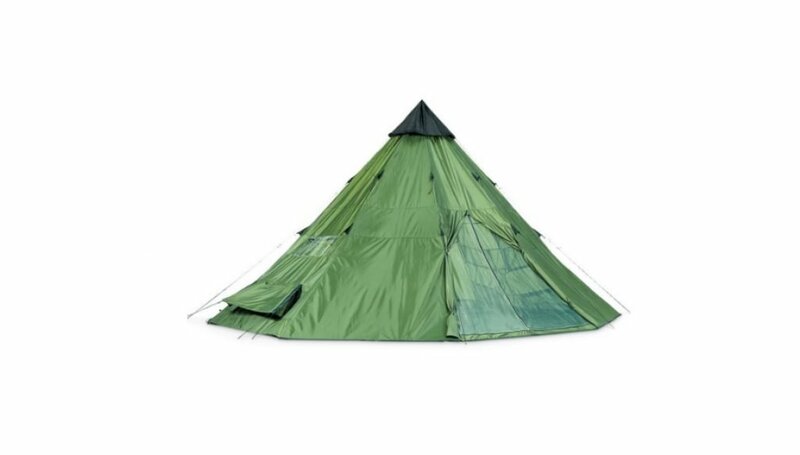 The bottom of the tent is waterproof tarp and the main material (210T Polyester) is also waterproof! 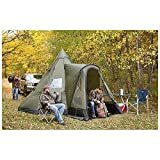 FAMILY TENT: This is the perfect tent for a group of people or family to enjoy camping and gather around the campfire! This is by far the biggest teepee tent on our list. If you have a pretty big group of people who want to go camping together, this is the best choice, although it takes an awful number of stakes. It is 9.5-feet high and can comfortably fit in 9-11 people depending on how many sleeping cots are positioned inside. This is one tent which makes us believe that a big tent does not always have to be difficult to set up. Having said that, we must add that it is very difficult for a single individual to set this thing up; one person should hold the central steel pole while the stakes are driven through by the helping hand. One thing that we liked immensely was the fact that there were factory-sealed seams, which made the tent more waterproof than most of the tents. The windows are weatherproofed and there is a lot of ventilation inside the tent itself. We also appreciated the fact that there are internal shades for enhanced privacy. Also, the sewn-in polyethylene floor helps the tent to be both sturdy as well as waterproof. While the pull-through guy lines are adjustable, it is true that you will need a certain amount of expertise in this area for them to actually work. 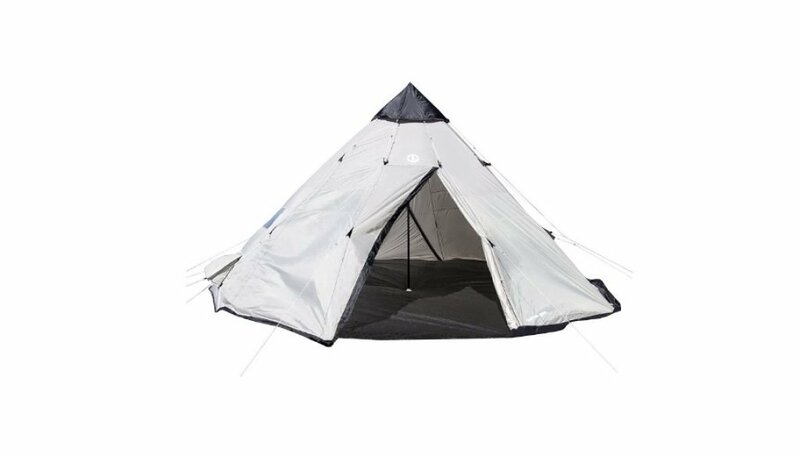 And although the tent is mass produced, it is also true that the design elements and the material used are extremely good. 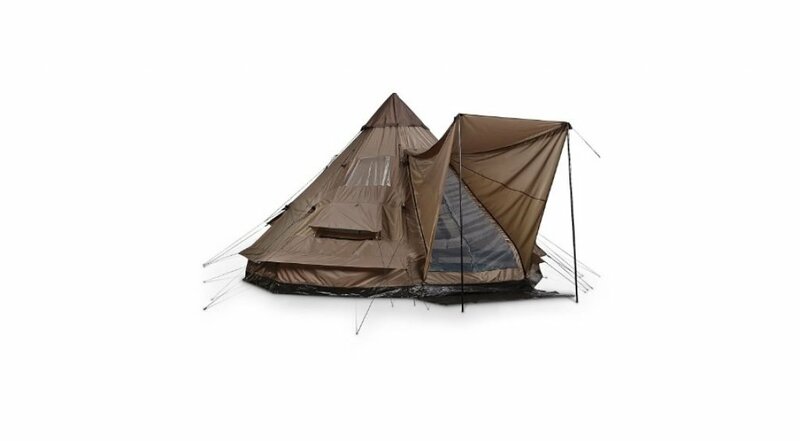 While this is not a high-end tent, it certainly beats all the competition in this price range. One more thing, such big types of best teepee tents must be chosen with a lot of thought; they should not be a spur-of-the-moment purchase. Being a big tent, it will require a lot of areas to set it up. This is our most highly recommended teepee tent for experienced users. Extremely spacious interiors usable for 9-11 people, separate of cost. Lightweight and portable; looks big, weighs small. Very tall. If you are looking for headspace, this is a must-buy. Setup is a breeze given its size only when two people are working simultaneously. Takes up a lot of space to set up. Additional waterproofing options may be necessary given the weather. Added cords can seem to be pretty flimsy to some users. Tahoe Gear is a name that is pretty well-known in the camping and hiking equipment business. 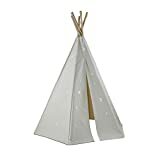 This is its first entry in this list of teepee tents for kids and it is a giant teepee tent. While it has enough space to provide shelter to 9-11 people, similar to the last one on our list, it is a shorter teepee tent. This means that while the tent may look a bit shorter on the outside, inside the height is still comparable to the best of the lot. One great thing that this tent has a great bug-proof nature, something that many tents lack. Tahoe Gear has built-in 4 PVC windows and multiple floor vents, besides the mesh roof panels, all for the sake of ventilation. The fabric with which the tent has been manufactured is also of very high quality with 1000mm polyester, which makes us believe that this tent is worth every penny. Again, the durable mesh-protected windows help in protecting the inhabitants of the tent from any bug attacks. It is ideal for all weather usage and is instrumental in creating the brand. Note that the floor is not sewn into the body; it is attached with clips, so that is something that you have to remember. Otherwise, the size is great and we were able to fit in four queen size air mattress in the middle of a downpour, although it needed two people to pitch the tent. Given the many benefits which are provided, we believe that the price range is pretty good, and adding this in this top 7 best teepee tents for kids list is fully justified. A very big tent ideal for that elusive family outing. The design is unique and very stylish. The superb ventilation is ideal for use during the warm weather months. For many users, the tent can be a bit difficult to set up. Given the giant size, it requires a lot of space to set up. 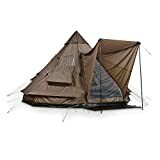 The great benefit of this departure from the green olive model that we have mentioned before is this tan colored teepee. This can easily be considered to be an upgraded version of the Guide Gear Teepee Tent 10′ x 10′ tent that has been described below. There is a great addition to the common model: an awning. Besides, this is easily one of the most waterproof teepee tents: it is manufactured of heavy-duty polyester that also has a 3,000mm polyurethane coating. Note that while there are two entrances/doors in the tent, only one has the awning. The 12 x 12 tent also boasts a waterproof 210-denier polyester shell which can withstand even the heaviest of downpours. The weatherproof material-covered mesh windows also provide lasting protection from various bugs. Note that this tent is not intended to be carried in a backpack: it comes in a rather neat case. Guide Gear’s engineers have taken some time in deciding the total design of the tent. When we tried fitting a queen air size mattress inside, we could do it without knocking down its steel center pole. What we really like about the tent is the 2 large-sized storage pockets inside the tent. Keep your valuables or any other thing off the ground with these compartments. Easy to pitch, plenty of space. Has a great design quotient. Great to use even in heavy even in heavy downpours. Cannot be carried in a backpack but in its own case. This has been included because kids normally prefer to play in teepee tents. They evoke a sense of an era gone by and have great recall value. 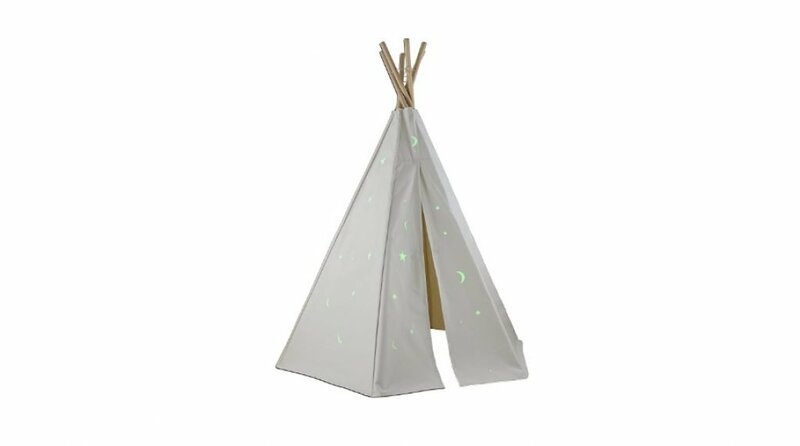 This is also the best night-time teepee for kids as they are water-repellent and we can bet a hundred bucks that the kids will enjoy the glow-in-the-dark moon-and-stars stickers. These stickers bring to life the night sky which was visible to the Native Americans hundreds of years ago in the Great Plains. This kids’ tent is fire retardant and boasts of being constructed with durable cotton canvas that will not easily tear. The outside of the tent can be easily decorated with water-based or latex-based paints. With dimensions of 60 x 60 x 60 inches and complying with the rules as laid down by the US Toy Safety Standards, the tent is ideal for both indoor and outdoor use. The tent is also easy to dismantle, as is often the case with kids; their moods keep changing. When we tested it in high winds, it was (naturally) not very effective in high winds; however, it is no pushover. Many users have complained that the unit delivered to them does not share the same color that is shown in the descriptive page; however, that is something that may be blamed upon the logistics of shipping such items. Otherwise, a very good buy if you’re looking for best teepee tents for kids (April 2019 Edition). Water repellant and fire resistant. Usable both indoor and outdoor. Users have often dismissed the construction as being flimsy. May seem over-priced to many users. This teepee for kids buying guide is intended to bring out certain criteria that must be considered before buying a teepee tent. These criteria must be followed so that you get the value for money as well as the ideal tent for the correct situation. For example, if you do not consider the waterproof nature of a tent before you head out to a jungle trip, you will be in a very tricky situation. So, here are all the factors that need to be consulted before buying teepee tents for kids. The size of the tent is an important factor to consider. 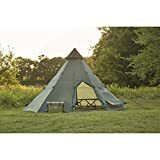 For example, if you have a large group of people who wish to go camping and there are sleeping cots that you have, you will need a much larger teepee tent. In that case, the 18-footer tents will be good enough for you. If, on the other hand, you have a smaller group of people, a 10 to 12-foot tent should suit you admirably. There is another aspect in the size problem: the size of the area where you intend to pitch the tent. As you already know, a giant 18-foot tent takes a very large piece of land to be pitched. Such a large piece of land may not be readily available in the area you are choosing to camp at. In that case, you might face a lot of difficulties. If you are camping inside a protected area, for example, the tent base may be a bit less. Hence, the size has to be chosen very carefully. Setting up a tent is something that only avid hikers, campers, and outdoorsmen do. Hence, it makes sense that the setup difficulty is something that has to be kept in mind. Most of the modern teepee tents have a central steel pole around which the tent is erected. This requires two persons to do the setup of the tent. Besides, there are certain tents that are more intricate to set up. The bigger tents also need more stakes to set up and can be too much for a single person to handle. What we are essentially trying to tell is that most of the best teepee tents often advertise their products as being usable by a single person. This may or may not be the case, depending on the model. So, always keep that in mind. What material the tent is made out of is an important consideration before you make a purchase decision. Ideally, the material should be waterproof and must also be extremely durable. 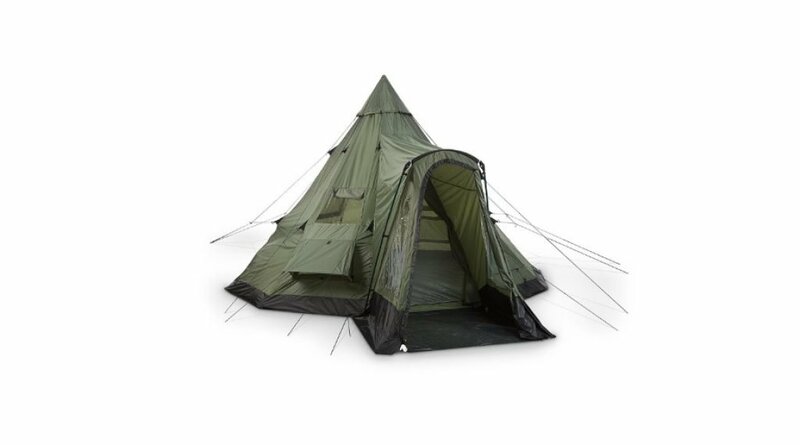 As you have seen on the list, most of the tents have 190-denier polyester shell material which is acutely effective in increasing the durability of the tent. You must also ensure that the central tent pole is made of steel. This is the major support for the tent and is something that must have excellent construction. Steel pipes combine strength with low weight and are also portable. If you want, you can also consider tent poles manufactured with carbon fiber or even aluminum. These are the two materials which will be able to combine the strength and the weight ratio that is desired. Just to be on the safe side, try and pitch the tent in the comfort of your backyard before you head out to the open. This will also give you some much-needed practice. Do not try lugging around too heavy a tent in your backpack; it serves no practical purpose. As you have already read on this list, there is one tent which comes with its own little case. Try and find an option like that which will help you in keeping some weight, even if it is just a few pounds, off your back. The lighter a tent is, the more fun the trekking trip becomes. When the teepee tents were used by the native people of the Great Plains, they were designed to be cool when used in the hotter months, warm when used in colder climes, and waterproof. Nowadays, as more and more people head out camping, the teepee tents have become ubiquitous. Hence, more and more companies are now manufacturing these products without strictly adhering to the proper protocol. We wish to inform the would-be user that the ventilation of any tent is very important, especially when there are multiple people inside. Besides, the number of windows that a tent has is also something that should be kept in mind. While it is true that the more windows there are, the better it is, these windows can also be bug-prone. So, make sure that you are carrying a quality anti-bug spray. Insect repellants are something which you can never over-spend on! The importance of these two features cannot be overstressed. The teepee tent must be highly waterproof; that way, no matter where you are, you will not be caught unprepared. And since many users have pointed out that they love cooking with their small butane stoves inside the tent itself, the tent must also be flame retardant and completely fireproof. Many avid outdoorsmen love to pitch their tents in the middle of nowhere. Lightning strikes are certainly not unheard of. The flame retardant nature will help the users survive. These are modern tents and must have the necessary creature comforts that people need. Most modern camping sites now offer electricity to the camps; they can be used via an extension cord. Look out for electric cable sleeves when buying a teepee tent. Try and look for an additional tarp as part of the teepee tent. An additional tarp is something that is important in insulating as well as protecting the tent itself. While such tarps might also be procured separately, it is best if it is included in the tent footprint. Lastly, look out for added vestibule gear. Since many users go camping with their pets, it is ideal to have dog toilets and an added vestibule gear. Some more high-end tents often have extra equipment that is part of the package. Other Great Resources from Trekking Gears!! Remember that the brand name of a tent often means nothing. Buy the one which suits your need and your budget. It is best to use the tent in your backyard before you take it outdoors. Lastly, we often keep updating this list of best teepee tents for kids 2019, so do bookmark us. Comments are welcome. TrekkingGears is a participant in the Amazon Services LLC Associates Program, an affiliate advertising program designed to provide a means for sites to earn advertising fees by advertising and linking to Amazon.com. Additionally, TrekkingGears.com participates in various other affiliate programs, and we sometimes get a commission through purchases made through our links.